Kent Haruf, who faced a series of publishing rejections before emerging at 41 as an acclaimed novelist of small-town intrigue and fragile community bonds in books such as “Plainsong” and “Where You Once Belonged,” died Nov. 30 at his home in Salida, Colo. He was 71. His publisher, Knopf Doubleday Publishing Group, confirmed the death and said the cause was cancer. Mr. Haruf (whose name rhymes with “sheriff”) was a Methodist preacher’s son and grew up in a family of book lovers. He attended a prestigious writers workshop in Iowa but struggled to interest publishers in his prose. He took a series of menial jobs to support his wife and three daughters. He was 41 before his first short story appeared in a literary magazine, Puerto del Sol. His first novel, “The Tie That Binds,” was published that same year, 1984, to promising reviews. The book focused on the hardscrabble life of a Colorado woman who cares for her tyrannical and ailing father at the cost of an early romance. Mr. Haruf’s next novel, “Where You Once Belonged,” came out in 1991 and chronicles a former high school football star who ruins many lives through his greed and arrogance. The book, narrated by a fictional newspaper editor, was again lauded for the author’s ability to capture small-town lives in exacting prose. Many of Mr. Haruf’s stories were set in the fictional small town of Holt, Colo., a composite of the Colorado towns where he was raised as his father moved from one church assignment to the next. “Plainsong” is based in Holt, and its narrative circulates among a variety of local residents. Mr. Haruf was an admirer of Sherwood Anderson’s “Winesburg, Ohio,” which has a similar structure. “He has conjured up an entire community and ineluctably immersed the reader in its dramas,” book critic Michiko Kakutani wrote in the New York Times. Kent Haruf was born in Pueblo, Colo., on Feb. 24, 1943. He graduated from Nebraska Wesleyan University in 1965, then spent two years in the Peace Corps in Turkey. “It made me less interested in material things and more interested in the qualities of the human spirit,” Mr. Haruf told a Peace Corps publication. Upon his return, he became a conscientious objector during the Vietnam War and fulfilled two years of alternate service in hospitals and an orphanage. He then held a series of odd jobs, from construction to chicken ranching, before completing a master of fine arts degree from the University of Iowa in 1973. He thereafter spent much of his career as a teacher, working in Wisconsin and Colorado schools from 1976 to 1986. He then was an assistant professor at Nebraska Wesleyan for five years and then at Southern Illinois University in Carbondale from 1991 to 2000. His marriage to Virginia Koon ended in divorce. In 1995, he wed the former Cathy Dempsey. Besides his wife, survivors include three daughters from his first marriage; and five stepchildren. He recently completed his sixth novel, “Our Souls at Night,” which will be published next year, according to Knopf. 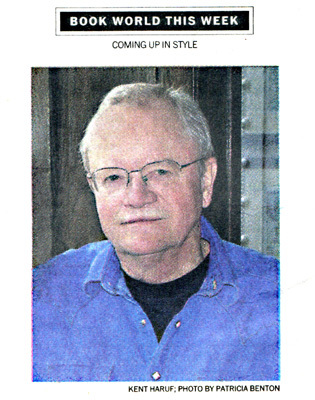 Kent Haruf, T-8, was a good writer, and recognized author. I've compared him to Faulkner in terms of his feelings for and insight into his community. Others see Willa Cather (My Antonia). His language is straight-forward within space, much like life on the Great Plains in the northeastern corner of Colorado. Kent died last fall, and they have recently printed an unpublished book of his, Our Souls at Night. This book review is at the Washington Post, and I copied the photo also from the [Washington] Post. The prize-winning author of the acclaimed trilogy “Plainsong,” “Eventide” and 2013’s “Benediction” - all set in the fictional town of Holt, Colo. - died Sunday at the age of 71. The cause was interstitial lung disease. He is survived by his wife, Cathy, and three daughters. Additional survivors are three stepdaughters and two stepsons. Among Haruf’s many literary honors were the prestigious Whiting Foundation Award for his first novel, “The Tie That Binds“; the Center of the American West’s Wallace Stegner Award, given to those who’ve “made a sustained contribution to the cultural identity of the West through literature, art, history, lore, or an understanding of the West”; and a special citation from the PEN/Hemingway Foundation. “I thought ‘Plainsong’ and ‘Eventide‘ were two of the best books ever written about Colorado,” Hickenlooper said. World premiereIn January, theatergoers will be able to join those two old folks when“Benediction” receives its world premiere. 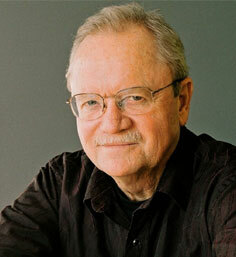 KENT HARUF SERVED in Turkey (1965-67) and is the author of three novels. His novel, The Tie That Binds received a Whiting Foundation Award and a special citation from the PEN/Hemingway Foundation. He is also the author ofWhere You Once Belonged. Kent’s new novel, Plainsong, has just been published by Knopf and is the “hot” book of the fall ‘99 publishing season and was a finalist for this year’s National Book Award in fiction. I interviewed Haruf in Colorado, the state he was born, raised and will soon retire in, just before a public reading of Plainsong at the Tattered Cover bookstore in Denver. The interview took place in the posh lobby of the Brown Palace Hotel, a sophisticated sanctuary for the elite and world leaders while in town (President Clinton and Mikhail Gorbachev were guests during the G-7 conference in 1997). Admittedly, his Peace Corps experience may have had some effect on his three daughters: Sorel, a Volunteer in Thailand (1990-92); Whitney, who studied for a year in China and is currently in India with a program called “Friends World;” and Chaney, a senior at the University of Nebraska. How did you ever cross paths with the Peace Corps? Like a lot of young people I had a notion of doing some good in the world and seeing as much of it as possible. I ended up in Turkey where I taught English for a middle school in a village called Felahiye. - wonderful, an enormously exhilarating experience in so many ways! It basically taught me that, in elemental ways, people are the same all over. It also taught me how to deal with isolation and boredom. I read a lot and that’s when I really began to start writing. A lot of that was journal keeping, but I did write some short stories which weren’t very good. In fact, they were pretty awful. Has two years in Turkey played any part in your fiction, directly or indirectly? Not directly. I guess there is an abstract quality of meeting other cultures and the mutual acceptance that occurs, and that does have a bearing on what your interests are, how you write and what you write about. It has been a long time since you were a Volunteer. Does anything of those years, and that experience, play into your life today? If you’re asking ‘did it shape who I am today’ - I don’t think so. The Peace Corps simply confirmed the direction I was going in anyway. It did make me less interested in material things and more interested in the qualities of the human spirit. After the Peace Corps you never see yourself as being poor. There, you see real poverty and you can’t feel very sorry for yourself after that. This novel, and your other two have focused on families and intimate relationships as well as the landscape of small town American life. Do you see this world as disappearing? Well, I’m not a sociologist so I really can’t comment on the collapse of the American family or anything like that. But I do think that human relationships are always interesting and families are where they are the most intense. At the end of this crazy century I hope that people can focus on what’s important and act out of warmheartedness toward each other even though they are not blood related. Plainsong ends with the characters becoming an extended family with both sides giving something and getting something out of it. Sounds like a happy ending. Do you like happy endings? Not especially. Plainsong is more upbeat than my previous novels but there are still problems that are not resolved. I don’t believe in happy endings. There used to be a saying about novels, “they usually end in a funeral or a wedding.” This book ends somewhere in between. Realistically, life’s not very tidy and I think this is an actual portrayal of real life. Your new book has been compared, in its literary quality, toCold Mountain. Does this sudden attention from the New York literary establishment surprise you? Yes, in many ways it does. The other books received good critical attention but just didn’t sell well. I’m pleased and surprised that this one does both. Do you think of your work in any sort of literary tradition, or do you think of yourself as being out on your own in southern Illinois? I think it fits into the 20th Century literary tradition. But I reject the notion that it’s regional. Simply because a novel is set in, say, Colorado, doesn’t mean it’s western literature. It’d be reductive to say Faulkner was only a southern writer. Of course, I don’t mean to compare myself to Faulkner. What do you see as the strengths of your writings? I’d rather someone else say that than me. What current writers do you read and appreciate? James Welch and Louise Erdrich, both Native American writers; Richard Ford, Cormac McCarthy, Larry Brown, and Alice Monru. As for the classics, whenever I get the chance, I go back to Faulkner and Hemingway repeatedly. The only one I’ve read much of is Bob Shacochis. I’ve met him and we have talked about the Peace Corps. You’re not into happy endings, so how does it all end for Kent Haruf? (laughs) Life is very good for me right now. I’m happily married, I have three great daughters and I have another book to write. That’s about as far as I’m going to take it right now.